Welcome to material raum form! We have been working with minerally bound materials for over twenty years, exploring their use in interior and exterior spaces, living spheres, and home décor, both in private residences and business premises. When it comes to the design and furnishings of your home, office, or shop, our products do not only lend your rooms and premises a unique, aesthetical flair and an exceptional atmosphere. They also show the architecture of your place to its best advantage. Please feel invited to have a look around in our virtual exhibition. 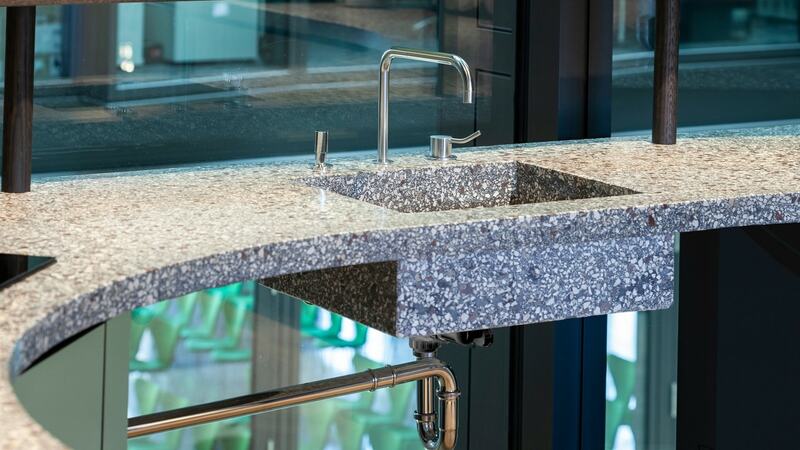 Countertops made by material raum form are very convenient pieces of furniture. Moreover, they allow a full integration of modern kitchen technology. They open completely new possibilities when it comes to planning your kitchen. We are not exaggerating – we really transcend boundaries. Sometimes it is just fun to play with fire. A good fire built in a fireplace not only gives off warmth. It is also very sensuous. To have a fireplace is a wonderful thing. You can calmly watch the soft gleam of the embers – sometimes for hours, without ever getting bored.